1. Pat the chicken thighs dry on kitchen paper and cut away the excess skin with scissors. Heat the oil in a large flameproof casserole and fry the chicken, skin-side down, for 5 minutes until crisp and golden. Turn over, add the onion and fry for a further 5 minutes. 2. Stir in the gravy, chestnuts, thyme and juniper and bring to a gentle simmer. Cover with a lid and cook gently for 15 minutes. Stir in the potatoes, cover and cook for 10 minutes. Stir in the greens and cook for a further 10 minutes until all the vegetables are tender and the chicken is cooked through with no pink meat. Serve in shallow bowls. 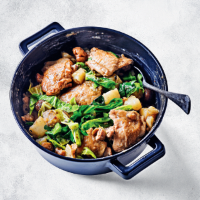 Cook’s tip You could also make this with a 900g pack essential Waitrose British Chicken Drumsticks.